The Void is about a police officer who shortly after delivering a patient to an understaffed hospital, experiences strange and violent occurrences seemingly linked to a group of mysterious hooded figures who surround the outside of the building. To say strange and violent occurrences is an understatement as The Void sets up scenarios that are nothing short of horrific nightmares. The set up feels like Assault on Precinct 13 and then shifts gears into The Thing crossed with 2015's Baskin and the film plays out beautifully. One of the things I loved about it was I never was quite sure where the story was headed or where it would end up. And the ride from beginning to end had me smiling from ear to ear. The outside scenes in the movie are very dark and very quiet. I could barely make out what was going on save for the very small amount of light that shined on whatever needed to be seen to understand. This barely there lighting let's the viewer know that this story is a dark one and like there is little light, there is also little hope. It's also a wonderful play on the title as the quiet darkness creates the sense of a void, like something is missing. And that's pretty much how the movie works: it gives you just enough to comprehend but never over plays it's hand. While inside the hospital the film takes on a yellowed and timeless look, as if the story could be happening now or 25 years ago. Once our group realizes they are surrounded and trapped in the hospital by a large group of white robed and masked strangers, the fun begins as they realize the true evil is waiting for them in the bowels of the building. What follows is an all out creature feature gore fest, a scary and unflinching hell on Earth. The acting is strong all around, especially Kenneth Welsh as Dr. Powell who delivers his lines in a measured and steadfast speech that indicates a man who possesses a great and dark knowledge. It's a truly scary portrayal through use of voice. The effects and creature design were some of the best I've seen recently and the vision demonstrated by writers and directors Jeremy Gillespie and Steven Kostanski is truly impressive. To say too much of the evil inside the hospital would be a disservice to potential viewers so I've remained as vague as possible about the details of the plot. 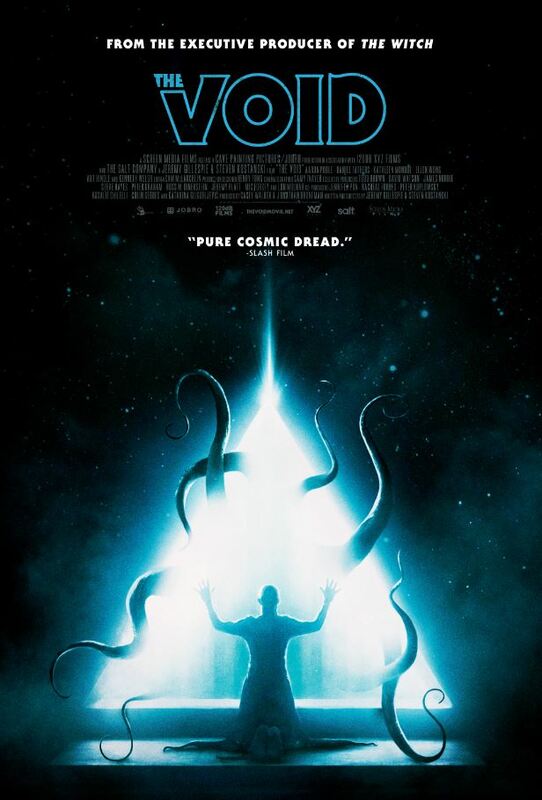 The Void is not an easy film. It doesn't spoon feed you the answers you may want and instead leaves you thinking and contemplating what happened. Most importantly it leaves you wanting to watch it again. The Void looks beautiful, is truly scary, has awesome creature designs and I whole heartedly recommend it. I have been hearing about this film and it sounds like it is right up my dark alley! Yeah it's definitely dark! A great creature feature and a fun watch.